Objectives: To assess the effectiveness of β blockers in short term treatment for acute myocardial infarction and in longer term secondary prevention; to examine predictive factors that may influence outcome and therefore choice of drug; and to examine the clinical importance of the results in the light of current treatment. Design:Systematic review of randomised controlled trials. Subjects: Patients with acute or past myocardial infarction. Intervention: βBlockers compared with control. Main:outcome measures All cause mortality and non-fatal reinfarction. Results: Overall, 5477 of 54 234 patients (10.1%) randomised to β blockers or control died. We identified a 23% reduction in the odds of death in long term trials (95% confidence interval 15% to 31%), but only a 4% reduction in the odds of death in short term trials (−8% to 15%). Meta regression in long term trials did not identify a significant reduction in effectiveness in drugs with cardioselectivity but did identify a near significant trend towards decreased benefit in drugs with intrinsic sympathomimetic activity. Most evidence is available for propranolol, timolol, and metoprolol. In long term trials, the number needed to treat for 2 years to avoid a death is 42, which compares favourably with other treatments for patients with acute or past myocardial infarction. Conclusions: β Blockers are effective in long term secondary prevention after myocardial infarction, but they are underused in such cases and lead to avoidable mortality and morbidity. β Blockade was once heralded as a major advance in the treatment of patients with myocardial infarction, but current evidence suggests that less than half of eligible patients receive it.1–3 The effectiveness of β blockers was appraised by Yusuf et al in 1985,4 but since then there have been nearly 3000 deaths among 23 000 patients randomised in new trials. Trials of β blockers now include a broader group of patients such as those at high risk or with accompanying heart failure, enabling the benefits identified by Yusuf et al4 in a restricted group of trials to be extended to such patients. Methods used in systematic reviews have also advanced. The development of regression techniques within meta analysis enables a more robust examination of the importance of factors that may mediate upon the effectiveness of specific drugs.5 Two such factors, intrinsic sympathomimetic activity and cardioselectivity, were identified as potentially important,4 and intrinsic sympathomimetic activity in particular seemed to be related to reduced therapeutic action. Given the changing use of drugs after myocardial infarction, the early promise of β blockade in these patients, and the continuing high rates of mortality associated with myocardial infarction, a new overview of these drugs is timely. We reappraised the effectiveness of β blockers for secondary prevention after myocardial infarction. Our main outcome was all cause mortality and the secondary outcomes were non-fatal reinfarction and withdrawal from treatment. We examined the effectiveness of β blockers in the acute phase immediately after myocardial infarction; their role in longer term secondary prevention; the importance of early initiation after the onset of symptoms; the extent to which specific pharmacological features of different β blockers may affect their performance; the magnitude of benefits achieved by β blockers; and the clinical importance of β blockers. We included randomised trials without crossover, with treatment lasting more than one day, and with follow up that examined the clinical effectiveness of β blockers versus placebo or alternative treatment in patients who had had a myocardial infarction. Treatment may have begun at any stage before or after myocardial infarction and may have been commenced intravenously. We conducted sensitive electronic searches of Medline (1966-97 through Ovid), Embase (1974-97 through Dialog), Biosis (1985-97 through Edina), Healthstar (1975-97 through Ovid), Sigle (1980-97 through Blaise-line), IHTA (1990-97 through ECRInet), conference papers index (1984-97 through Dialog), Derwent drug file (1992-97 through Dialog), dissertation abstracts (1992-97 through Dialog), Pascal (1992-97 through Dialog), international pharmaceutical abstracts (1992-97 through Dialog), and science citation index (1981-97 through BIDS). We reviewed the reference list of each identified study. We also examined existing bibliographies and reviews for relevant studies. From each study we abstracted data on the total number of patients randomised to active treatment or control, β blocker, route and dose of drug, duration of treatment, loss to follow up, level of blinding, concealment of allocation,6 specific study inclusion and exclusion criteria, duration of follow up, deaths, reinfarctions, and withdrawals. Data were checked by a second researcher. We estimated pooled odds ratios for short and long term treatment trials separately using the fixed effects approach of Mantel Haenszel. 7 8 As we anticipated systematic differences between the results of studies (heterogeneity), we also routinely estimated random effects pooled odds ratios. Standard random effects methods for meta-analysis (pooling the results of studies) 9 10 may provide unduly precise estimates of effect, as they assume that the observed distribution of effects is the true treatment distribution—an assumption that may not be valid in sparse data. 5 11 12 Therefore, we used the full random effects approach on the basis of the numerical integration techniques using Markov chain Monte Carlo simulation, with appropriate uninformative priors and the “Bugs” software described by Smith et al.5 This provides a more robust estimate of the precision of random effects estimates and can account for trial groups that experience no events without resorting to crude fixes such as adding a value to each cell to estimate an individual odds ratio. A further advantage of this approach is that the effects of predictive factors may be examined. 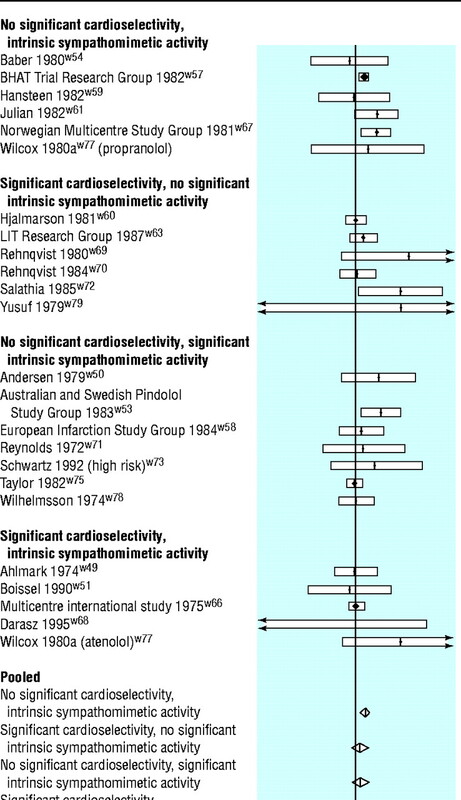 Our main treatment related covariates were cardioselectivity and intrinsic sympathomimetic activity, which were examined in the long term trials using a nested random effects logistic regression model(see Appendix). We also made a separate examination of the effects of initial intravenous treatment in long term trials, and the effect of additional treatment options through the proxy variable of publication date before or after the median year (1982). We assessed convergence using the methods described by Geweke13 and visual inspection of convergence plots. We identified 82 randomised trials that examined the effects of β blockers compared with control and that had data on all cause mortality. Overall, 5477 of 54 234 patients (10.1%) randomised died. Fifty one trials examined acute treatment with β blockers—up to 6 weeks after onset of pain (table 1, and 31 trials examined long term treatment with β blockers—6 to 48 months (table 2). Overall, 3062 of 29 260 patients (10.5%) randomised in short term trials died. Although 51 trials were identified that examined the effects of short term treatment, only 45 of these had observed deaths in either the intervention or control groups. The major challenge to the quality of this group of trials was that small numbers of patients randomised to treatment or control led to many trials with either no, or only a small number of, deaths. The pooled random effects odds ratio for the short term trials was 0.96 (95% confidence interval 0.85 to 1.08); that is, a small and non-significant reduction in the odds of death (fig 1). Even if this result is correct it would represent a reduction of only 0.4 deaths in 100 patients, which does not achieve conventional levels of significance (−0.2 to 1) as 250 patients would require treatment to avoid one death (100 to ∞). Analysis of predicted benefit by drug identified no individual drug that differed significantly in effect from the pooled result. Although most trials were undertaken before the second international study of infarct survival in 198816 firmly established the importance of thrombolysis, a large trial of thrombolysis in myocardial infarction in 198917 randomised patients who had received recombinant tissue plasminogen activator within 4 hours of the onset of pain to early metoprolol or control. During 5 days of follow up, there was no difference in mortality between the two groups. Two subsequent myocardial infarctions were, however, avoided for every 100 patients treated (0.2 to 4). Overall, 2415 of 24 974 patients (9.7%) randomised in the 31 long term trials died. In general, the quality of studies was reasonably high, with adequate follow up achieved in many trials (table 2), though the proxy quality variable, concealment of allocation, was seldom adequately reported. Overall, the pooled odds ratio from the full random effects model was 0.77 (0.69 to 0.85). Results from the standard fixed effects model were similar (fig 2). Because of potential confounding due to the differences in length of study follow up, we used the random effects approach for incidence of risk difference to estimate the normalised annual reduction in mortality across the trials. This approach suggests an annual reduction of 1.2 deaths in 100 patients treated with β blockers after myocardial infarction (0.6 to 1.7); that is, about 84 patients will require treatment for 1 year to avoid one death. A similar approach was used to estimate the effects of treatment on reinfarction, although only 21 of the 34 comparisons provided data on reinfarction, resulting in wider confidence intervals and the potential for reporting bias. This analysis suggests an annual reduction in reinfarction of 0.9 events in every 100 (0.3 to 1.6); that is, about 107 patients would require treatment for 1 year to avoid one non-fatal reinfarction. Initial intravenous dose— We investigated the extent to which initiation of treatment with an intravenous dose of β blockers predicted mortality in the long term trials. Applying initial intravenous dose as a covariate term in the analysis suggested no additional benefit among patients treated in this manner (odds ratio 0.87, 0.61 to 1.22). Equally, this analysis indicates that there is no reason to delay treatment with a β blocker and that early initiation will lead to a greater period when benefits may be accrued from treatment. Classification of β blockers into those with or without important cardioselective activity or intrinsic sympathomimetic effect is not clear cut, and there is some debate in the literature on the attributes of acebutolol in particular.18–20 Table 3 describes the attributes of β blockers used in the trials. The odds ratio for the predictive effect of cardioselectivity on mortality was 1.10 (0.89 to 1.39), showing a non-significant trend towards reduced benefits. The odds ratio for the predictive effect of the presence of intrinsic sympathomimetic activity was 1.19 (0.96 to 1.47), which approaches statistical significance. The results were not sensitive to the classification of acebutolol. Reduction of benefits over time—We investigated whether benefits were reduced in the trials with additional therapeutic options for treatment introduced, in particular the increasing use of thrombolytic treatment, and aspirin. There is no evidence that treatment in trials after 1982 (the median trial) led to differences in benefit (odds ratio 1.04, 0.82 to 1.28). Choice of drug—Individually, only four drugs achieved a statistically significant reduction in the odds of death: propranolol (0.71, 0.59 to 0.85); timolol (0.59, 0.46 to 0.77); metoprolol (0.80, 0.66 to 0.96); and acebutolol (0.49, 0.25 to 0.93). The effectiveness of acebutolol is supported by a single moderately sized study, which is open to considerable measurement error. However, trials including propranolol, timolol, and metoprolol include 63% of the available evidence on the effects of long term β blockade in patients who have had a myocardial infarction. Different definitions and reporting made comparison of withdrawal of treatment withdrawal between trials problematic. Similar withdrawal rates between active treatment and placebo groups concealed two opposing effects: more patients are withdrawn from treatment groups because of suspected adverse cardiovascular reactions (most commonly brachycardia and hypotension), whereas in the placebo group withdrawal is more common because of the need for β blockade for hypertension and angina. Trials reports of dizziness, depression, cold extremities, and fatigue were only marginally more common in the treatment than control groups. Withdrawal in trials from both treatment and control groups varied from 10% to 30%. No adequate studies have been retrieved to compare directly the comparative tolerability of β blockers with different cardioselectivity or intrinsic sympathomimetic activity. Overall, 5151 of 21 954 patients (23.5%) withdrew from treatment (table 2). Overall, withdrawal was slightly more common in patients taking β blockers—the difference in the annualised rate of withdrawal compared with placebo being 1.16 in 100 patients treated (0.56 to 1.76, random effects; fig 3). No clinically important differences in withdrawal were observed between β blockers of differing cardioselectivity and intrinsic sympathomimeticity. Considerable evidence supports the routine long term use of β blockers in patients who have had a myocardial infarction, with substantial benefits in terms of reduced mortality and morbidity. Short term β blockade immediately after acute myocardial infarction seems unlikely to be of major benefit unless treatment is continued long term. This finding contradicts recent suggestions that β blockers should be more commonly used intravenously in acute myocardial infarction.21 In fact, evidence strongly indicates that unless β blockers are continued long term, the benefits suggested by Owen21 will not be observed. The benefits of β blockers on all cause mortality are impressive when compared with other frequently used long term treatments for the same patient group. Table 4 shows the effects of different drugs on the number of patients that would need to be treated for 2 years to avoid one death—for example, after a myocardial infarction 42 patients would need to be treated with β blockers whereas 292 patients would need to be treated with antiplatelets.22 The number and length of long term trials showing a consistent benefit for β blockers in unselected patients after myocardial infarction suggest lasting benefits in this comparatively high risk group, and suggest that β blockers should be continued indefinitely. Have benefits from β blockade declined with availability of new treatments? Our finding that β blockers benefit a broader group of patients after myocardial infarction supports the findings of the β blocker pooling project.23 Our finding also agrees with those of the cooperative cardiovascular project, which examined the medical records of 201 752 patients who had had a myocardial infarction.24 In that study, mortality was lower in every subgroup of patients treated with β blockade than in untreated patients. The findings of the cooperative cardiovascular project agree with our meta regression analysis, which found no evidence of a reduction in benefits from β blockade in more recent randomised trials. Indeed, rather than being overtaken by newer treatments, β blockers have a comparatively large effect in reducing mortality (table 4). Cardioselectivity was associated with a non-significant trend towards reduced benefit. The presence of an intrinsic sympathomimetic effect predicted a near significant reduction in benefits and thus drugs with this characteristic should be avoided. We found evidence to support the long term use of propranolol and timolol, the only two drugs indicated for prophylaxis after myocardial infarction in the British National Formulary. The use of either drug led to a substantial reduction in the odds of death, with narrow confidence intervals (fig 2). In contrast, atenolol, which is commonly prescribed in secondary prevention, has been inadequately evaluated in this setting. Although similar efficacy may be achieved—we found no evidence that all β blockers are not equal—it cannot be presumed that the benefits from propranolol, timolol, and metoprolol will be achieved with other drugs. Have benefits from intravenous β blockers declined over time? It may be hypothesised that intervention with thrombolytic drugs and antiplatelets reduces the potential for patients to benefit from intravenous β blockade. The first international study of infarct survival25 was completed before the results of the second international study16 became available, and before the use of thrombolytic and antiplatelet treatment was established. In contrast, the comparison of early versus delayed β blockade in a large trial of thrombolysis in myocardial infarction was undertaken in patients who all received thrombolytic and antiplatelet treatment.17 Although the much larger first international study of infarct survival trial25 achieved a slightly larger reduction in the odds of death with β blockers, measurement error could not be excluded as an explanation for this difference, as indicated by the test for heterogeneity between the trials (Q=0.025, df=1, P=0.87). The thrombolysis in myocardial infarction trial did suggest that early use of intravenous β blockers could reduce the early risk of serious arrhythmias. Concern has been voiced that β blockers are used in less than half of eligible patients after myocardial infarction,1–3 despite substantial benefits and generally low treatment costs. Concern that side effects affect the usefulness of β blockers must be tempered by the low yearly withdrawal from β blockers in the long term trials we reviewed. The clinical implications of our results are clear. New is not necessarily better, especially if the aim is to reduce mortality in patients after myocardial infarction. Furthermore, the underuse of β blockers in this group leads to a rate of avoidable death that should not be considered acceptable among those keen to practice evidence based medicine. Renewed interest in β blockers, particularly in patients with heart failure,26–28 may lead to substantial benefits for a broad range of patients. We thank Andrew Herxheimer, who assisted in the categorisation of included compounds, and Anne Burton for her diligent help in locating studies and in the preparation of the manuscript. Contributors: NF developed the protocol for the review, abstracted data, and undertook the majority of statistical analyses. JC conceptualised the review, developed the protocol, and provided clinical interpretation of the included trials and the results. PY developed the meta regression approach and provided methodological support in the review. JM contributed to the development of the protocol, data abstraction, and some of the statistical analyses. JH designed and implemented the electronic search strategies. NF and JC will act as guarantors for the paper. Where ptis the probability of an event in the intervention group, pcis the probability of an event in the control group, Iis the presence or absence of significant intrinsic sympathomimetic activity, and Sis the presence or absence of significant cardioselectivity. Similarly, α is a constant, δ describes the overall treatment effect, β describes the effect of intrinsic sympathomimetic activity, and γ describes the effect of cardioselectivity. Funding SmithKline Beecham Pharmaceuticals UK. The views expressed are those of the authors and not necessarily those of the sponsor. Competing interests This study was funded through an unrestricted educational grant by SmithKline Beecham, who supply carvedilol in the United States. JGFC has spoken at many meetings and educational programmes on drugs in heart failure, organised by pharmaceutical and device companies, and received fees and expenses. He has also received research funding from industry as well as the NHS, British Heart Foundation, and US Veterans Administration. .Increasing prescription of drugs for secondary prevention after myocardial infarction.BMJ1995; 311:917–918. .Use of secondary prophylaxis against myocardial infarction in the north of England.BMJ1991; 302:91–92. .β-Blockade during and after myocardial infarction: an overview of the randomized trials.Prog Cardiovasc Dis1985; 27:335–371. .Bayesian approaches to random-effects meta analysis: a comparative study.Stats Med1995; 14:2685–2699. .Empirical evidence of bias: dimensions of methodological quality associated with estimates of treatment effects in controlled trial.JAMA1995; 273:408–412. .Modern epidemiology.Boston:MA Little and Brown,1986. .Estimators of the Mantel-Haenszel variance consistent in both sparse data and large strata models.Biometrics1986; 42:311–323. 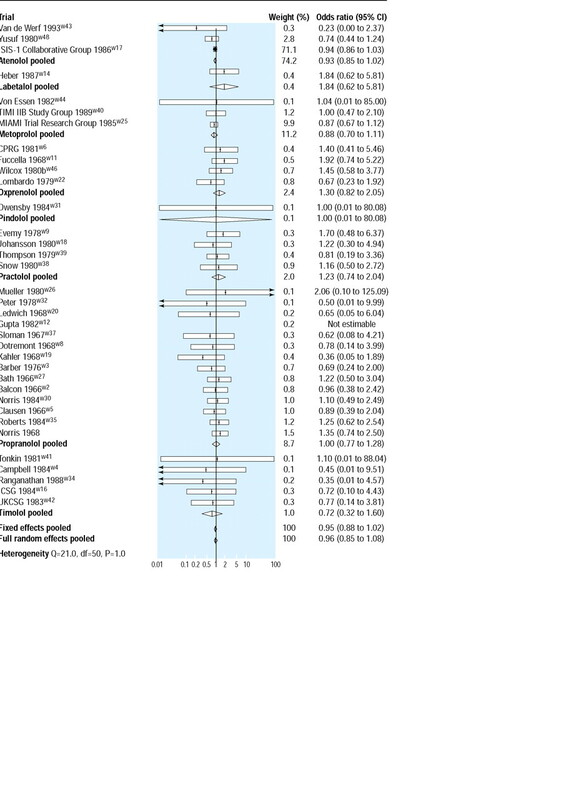 .Meta-analysis in epidemiology, with special reference to studies of the association between exposure to environmental tobacco smoke and lung cancer: a critique.J Clin Epidemiol1991; 44:127–139. .Meta-analysis in clinical trials.Controlled Clin Trials1986; 7:177–188. 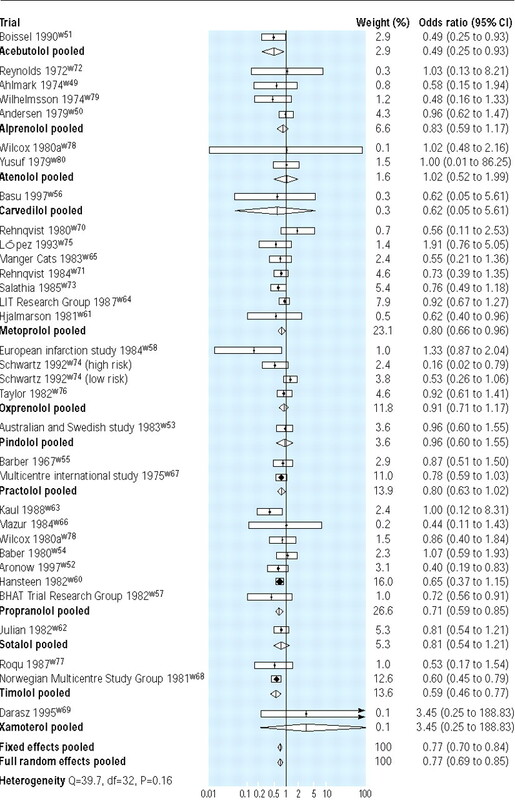 .Meta analysis for 2 β 2 tables: a Bayesian approach.Stats Med1992; 11:141–158. .A likelihood approach to meta analysis with random effects.Stats Med1996; 15:619–629. .BUGS: Bayesian inference using Gibbs sampling, Version 0.50. In: Cambridge:Medical Research Council Biostatistics Unit,1995. .Early or deferred zidovudine therapy in HIV-infected patients without an AIDS defining illness.Ann Intern Med1995; 122:856–866. .Deriving treatment recommendations from evidence within randomised trials: the role and limitation of meta analysis.Intern J Technol Assess Health Care (in press). .Randomised trial of intravenous streptokinase, oral aspirin, both or neither among 17 187 cases of suspected acute myocardial infarction: ISIS-2.Lancet1988; ii:349–360. .Comparison of invasive and conservative strategies after treatment with intravenous tissue plasminogen activator in acute myocardial infarction: results of the thrombolysis in myocardial infarction (TIMI) phase II trial.N Engl J Med1989; 320:618–627. .Reduction of sudden deaths after myocardial infarction by treatment with alprenolol: preliminary results.Lancet1974; ii:1157–1160. .The assessment of β-adrenoceptor-blocking drugs in man.Br J Clin Pharmacol1977; 4:413–425. .Intravenous β-blockade in acute myocardial infarction: should be used in combination with thrombolysis.BMJ1998; 317:226–227. .Collaborative overview of randomised trials of antiplatelet therapy. I. Prevention of death, myocardial infarction and stroke by prolonged antiplatelet therapy in various categories of patients.BMJ1994; 308:81–106. β-blocker pooling project (BBPP): subgroup findings from randomized trials in post infarction patients.Eur Heart J1988; 9:8–16. .Effect of β-blockade on mortality among high risk and low risk patients after myocardial infarction.N Engl J Med1998; 339:489–497. .Randomised trial of intravenous atenolol among 16 027 cases of suspected acute myocardial infarction: ISIS-1.Lancet1986; ii:57–67. .Effects of β-blocker therapy on mortality in patients with heart failure: a systematic overview of randomized controlled trials.Eur Heart J1997; 18:560–565. .Effect of β-blockade on mortality in patients with heart failure: a meta analysis of randomized clinical trials.J Am Coll Cardiol1997; 30:27–34. .The evidence for β blockers in heart failure.BMJ1999; 318:824–825. Latest trials on statins show large benefits?Lancet1997; 350:1525. .The effect of diltiazem on mortality and reinfarction after myocardial infarction.N Engl J Med1988; 319:385–392. .The effect of warfarin on mortality and reinfarction after myocardial infarction.N Engl J Med1990; 323:147–152. .Effect of long term oral anticoagulant treatment on mortality and cardiovascular morbidity after myocardial infarction.Lancet1994; 343:499–503.